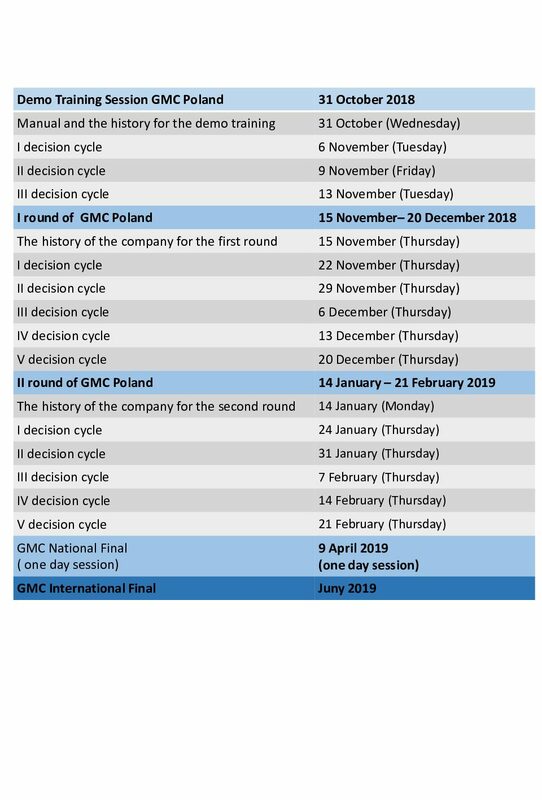 GMC Poland competition combines of two on-line rounds, each of around 5 weeks and a national final, one day event in Warsaw. Before the competition you will be invited to demo – trainee stage, introduction. Participants decide how much time will they spend on the simulation. But be careful – GMC simulation is addictive, engaging but this is a valuable time and energy investment. The decisions should be submitted no later that at 12 a.m. on the day of a decision cykle. the reports will be available the same day, not later than 6 pm. The first stage and second stage takes place on-line. This means that according to the schedule, before the deadline for a given decision (** ‘deadlines for submiting teams decision’), the team leader should log in to the website and complete a decision on behalf of his team. However, the exact time when the participants will be ‘debated’ and decide how much time you devote to the decision cycle depends on the team. *** Feedback after each decision is given as a report for the board, which is available for each team after logging in dates specified below. Based on reports, the teams develop further decisions and strategy. To participate in the contest You just need to have computer with MS Office and Internet access.